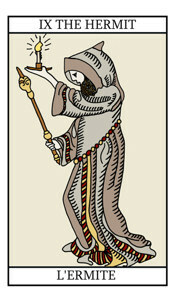 The Hermit card is symbolic of a time to take stock and to reflect. By having this card in your spread it could mean that you need to retreat away from all of the general hustle and bustle of life. You may need and want to take some time out to discover your inner peace and wisdom and decide what is really important to you. This card is one of enlightenment and connections and sometimes a desire to simply be just on your own, alone and away from it all. At present you may be feeling somewhat fed up with your present situation, but after a short period of withdrawal from it all you will emerge a much wiser and enlightened individual. As well as relating to you, this card can also be indicative of someone entering your life who will serve as a spiritual or physical mentor, who will help you to overcome whatever may be bothering you. Recent difficulties may have left you with feelings of isolation and loneliness, but once you have taken some time out and put past problems behind you, then you will be able to move on in a much more positive direction. The Hermit card is one of success through inner wisdom, reflection and spirituality.